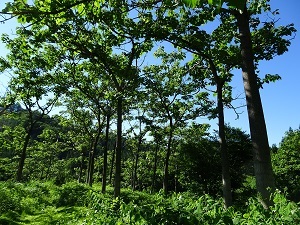 Mishima Town in Fukushima Prefecture is trying to establish a cultivation method for Aizu paulownia. The species has a history to be planted around 1600 A.D., but the knowledge of how to grow has been descended only empirically. The town office plans to set up nurseries and test planting areas in order to make an instruction manual based on scientific data. They will harvest in a short period of about 30 years, aiming to enhance their supply capability of the specialty wooden products. For more information, please refer to The Rinsei News, Issue No.589.